Stung by the Election Commission report on the Jaya Bachchan disqualification issue and reminiscent of the time when she steered clear of the office of the Prime Minister, Congress President Sonia Gandhi sought to push an aggressive Opposition on the backfoot by resigning as Chairperson of the UPA's overarching National Advisory Council as well her seat in the Lok Sabha representing the Rae Bareli constituency in Uttar Pradesh. 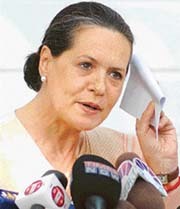 Should Sonia Gandhi have resigned from the Lok Sabha? The controversy over office of profit tonight claimed the parliamentary seat of a senior Congress leader Karan Singh who resigned from the Rajya Sabha, hours after his party chief Sonia Gandhi’s quitting from the Lok Sabha and as Chairperson of the National Advisory Council. Sriniketan-Shantiniketan Development Authority was not an office of profit. The Cabinet today did not discuss the controversial ordinance to exempt certain posts from the purview of office of profit, while the CCPA decided to prorogue the Budget session of Parliament, which was adjourned sine die yesterday. The unprecedented security umbrella on the eve of the visit of Prime Minister Manmohan Singh to his hometown here tomorrow has converted the holy city into a police cantonment since intelligence agencies feel that certain forces, inimical to the current bonhomie between India and Pakistan, may play mischief. We have not considered the ordinance. All options are open. We will discuss it with other political parites. The Prime Minister, Dr Manmohan Singh, is likely to announce a Rs 570-crore package for the overall development of his home town at a public rally, scheduled to be held here tomorrow to mark the flagging off ceremony of much-awaited Amritsar-Nankana Sahib bus. Jet Airways and Air Sahara tonight extended the term of their share-purchase agreement by 90 days in a bid to salvage aviation history's biggest buyout deal for Rs 2,300 crore by Jet. The Cabinet today approved 3 per cent hike in dearness allowance for the Central Government employees. The increase in DA from 21 per cent to 24 per cent will cost the government an additional Rs 1,130 crore per annum.